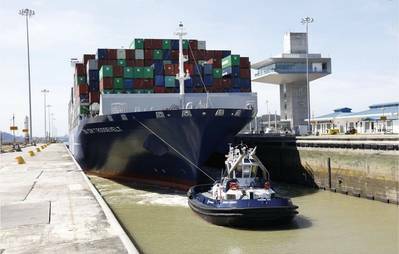 The Panama Canal welcomed the largest capacity vessel to ever transit the Expanded Locks, the CMA CGM Theodore Roosevelt. CMA CGM Theodore Roosevelt became the largest container ship ever to cross the new canal. Leaving the Port of Yangshan on July 28th, the CMA CGM giant crossed the new Panama Canal on August 22th. "Today's transit not only represents the growing success and adoption of the expanded canal, but also its impact on reshaping world trade," Jorge Quijano, the Panama Canal's adminstrator, said in a statement following the Theodore Roosevelt's passage. A notable event as, after 9 years of construction, the new canal was inaugurated a year ago. It is the first time a vessel of 14,000 TEUs is going through the revamped canal. Being 1200ft long and 158ft wide, the vessel is about as big as 8 times the Statue of Liberty. CMA CGM Theodore Roosevelt is now expected on the U.S East Coast where she will be, once again, the largest vessel ever to call there. It will pass under the Bayonne Bridge for its inauguration on September 7th. The Roosevelt takes her name from America's 26th president, who was a native New Yorker and served as the governor of New York State. Owned by the CMA CGM shipping line, the vessel is part of the Ocean Alliance's South Atlantic Express service, a group of 11 ships that can carry between 11,000 and 14,000-plus cargo boxes.